The elbow joint also has the attachment of the common flexor and common extensor tendons. The groups of muscle, associated with the respective tendons, assist in rotational movement of the forearm as well as the movements of the wrist and hand. The common conditions affecting the tendons around the elbow joint include tennis elbow and golfer’s elbow which result from an overuse injury to the tendons or result from repetitive activities such as sports, mechanical activities or weight lifting. 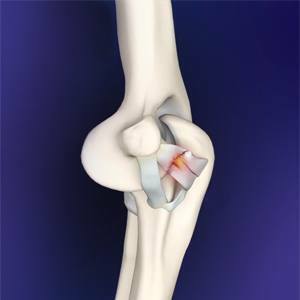 Ligament reconstruction is considered in patients with ligament rupture. Your surgeon will make an incision over the elbow. Care is taken to move muscles, tendons and nerves out of the way. The donor tendon is harvested from either the forearm or below the knee. Your surgeon drills holes into the bones of the upper arm and the forearm, around the elbow joint. The donor tendon is inserted through the drilled holes in a pattern similar to that of the original ligament complex. The tendon is then attached to the bone surfaces with special sutures. The incision is closed with sutures and covered with sterile dressings. A splint is applied to support the elbow for a few weeks. After the surgery, you might be advised for regular follow-up and also for a rehabilitation program for a better and quicker recovery.